GigaMune was founded as a spin-out from GigaGen in 2017. We are combining unique insight into T cell responses to tumors with massively parallel T cell receptor (TCR) discovery to develop the next generation of T cell therapies. GigaMune’s technology is best-in-class for discovery of anti-tumor T cell receptors. 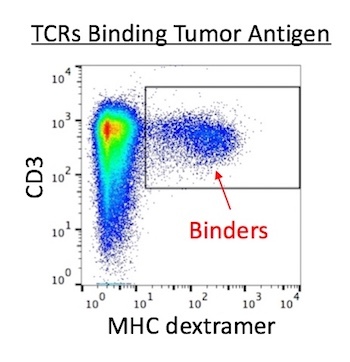 We make millions-diverse libraries of TCRs from natural human repertoires, and then find TCRs that bind and induce cellular activation in response to tumor antigens. We focus specifically on solid tumor indications where the clinical need is highest.